The burial place is located outside the city walls, a good walking distance from Jerusalem. It is still dark when the women set out with jars with sweet-smelling spices and balm to care for Jesus’ body. The gospels are ambiguous about which and how many women this concerns. Mary from Magdala is definitely among them, the woman who was freed by Jesus from seven demons. Luke 8:2 tells us that from then on she travelled with him, together with many other women who provided for Jesus and his disciples out of their own resources. Two other women are mentioned by name: Salome, the mother of John and James, and Mary, the mother of another James. Together with Mary Magdalene they had stood close to Jesus during the crucifixion and had accompanied him when he was brought to his grave. From there they had gone home as the Sabbath was starting. On the Sabbath they rested, while also Jesus rested in his grave from his work of redemption, just as God rested on the seventh day from his creation work. It is Holy Saturday. In Dutch this is called Silent Saturday: the Word of God is silent, lying in the ground like seed waiting to germinate. 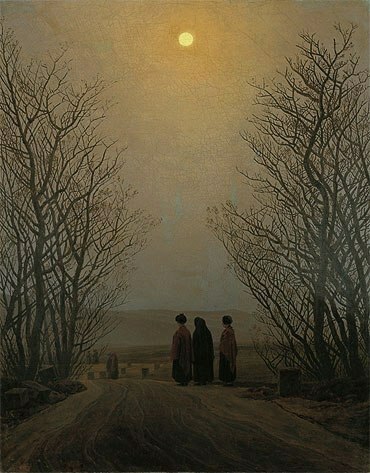 Friedrich’s painting shows us the women as they walk early in the morning of the next day in small groups towards the grave. It is a long road, the stone blocks along the path creating depth so that it goes on as far as the eye reaches. The moon is standing high in the sky, while the dawn slowly dispels the night. It is a silent world. In the foreground three women are standing like dark shadows between the bare trees. It must be cold this early in the morning, for they are wearing warm shawls and cloaks. Forlorn they are staring into the distance, overcome by the inertia of mourning. Their world has been brought to a halt. They still cannot understand that their Messiah has died. Scripture tells us that this morning not one of Jesus’ followers had any notion of a possible resurrection (the only ones who seriously did take this into account were the Pharisees!). We are looking at these motionless figures in the foreground from behind, as is the case in so many of Friedrich’s works, as it were inviting us as viewers to join the procession. Easter Morning (34 x 34 cm) is a small work painted with precision. It is the only painting with a biblical theme by this devout Lutheran artist, who was searching for new ways to render his faith in his art, ways that would do justice to his deep experiences of God in nature and daily life. He wrote: ‘The noble person recognizes God in everything.’ Friedrich wanted something different from the traditional symbolism and didacticism of the biblical scenes of Neo-classicism. He substituted them with contemplative landscapes full of nature symbolism. These are works with glowing sunsets, crosses on mountains, rainbows, ships returning in safe haven with masts shaped like crosses, glorious mountains bathed in light and mystical valleys full of mist. This approach was partly inspired by the symbolism in Dutch 17th-century landscape art. In this way he was able to capture the human experience of God as well as God’s presence in human life in new images drawn from the natural world. Also in Easter Morning the story is told through symbolical elements in the landscape. The rocks between the trees on the left of the road portray mortality. The lower half of the canvas plunged into mourning contrasts with a sky full of warm vitality, with the luminous moon high on the picture plane. The heavens are filled with majesty. The trees with their new shoots draw back in veneration and lift up their branches in worship. The winter gives way to the spring, darkness to light, death to life. The moon high in the sky like a king announces the good news: The Lord has risen indeed! Caspar David Friedrich: Easter Morning, 1833, 43 x 34 cm, Museo Thyssen-Bornemisza, Madrid.